Mother’s Finest are the prototype of a Funk Rock band. In fact they invented the genre in the early 1970-s, when they started taking that direction. The same group will be funking up Germany and Switzerland soon, some 47 years after their debut album was released. Thanks to the lady in the center of both the stage and the attention, Joyce ‘Baby Jean’ Kennedy and her partners, the endeavor Mother’s Finest took off like a rocket. Ever since she founded this band with her colleagues, the vocalist and percussion hero Glenn “Doc” Murdock, the guitarist Gary “Moses Mo” Moore and bassist Jerry “Wyzard” Seay in 1970, they spread fascination all over the place with their approach and the unlimited energy they are still known for. In 1972, when their first album hit the record stores, Funk as we know it today was still in its development stage. Mother’s Finest contributed to its advancement by integrating interesting off-beats into the sophisticated Blues Rock tunes with Gospel elements they played back then in Atlanta, Georgia. ‘Nigizz Can’t Sing Rock ‘n’ Roll’ was a pretty scandalous song title which caught people’s attention once the second album was out in 1976. Scandalous or not, that little controversy helped the band enlarge its fan base. ‘Fire’, one of the group’s all-time big hits, was part of that one too. By the late 1970-s, Joyce Kennedy had developed the power of her unmistakable voice further. Also her stage presence had become unbeatable. If her middle name had not been ‘Baby Jean’ it would have had to be Energy. Holy cow! Those gigs they played provided truckloads of that. ‘Love Changes’ is one of the most beautiful ballads by Mother’s Finest. In 1978, something happened in Germany. In the city of Essen, one of their concerts was recorded for the ARD‘s TV series ‘Rockpalast‘. That gig was the greatest Funk Rock event of all time. It defined that genre and it presented the band to a huge audience. Joyce Kennedy and her colleagues Murdock, Seay, Moore, Keck (keyboards) and Borden (drums) raised the f*****g roof. With his thick German accent, Albrecht Metzger announced the group in front of the camera: “German television proudly presents, as our guests, live in ‘Rockpalast‘, Mother’s Finest!” After the first bars of their first tune ‘Dis Go Dis Way’, the audience was fascinated. After the second song ‘Rain’, they were in love. And when Joyce Kennedy sang ‘Baby Love’, they were addicted. ‘Baby Love’ is one of their huge hits. It contains rather simplistic but convincing off-beats provided by bassist Jerry “Wyzard” Seay. Those turned this Blues Rock song into a stunning, funky experience and into the band’s hymn. When DJs, including the author of these lines, played ‘Baby Love’ at parties in the late 1970-s and the 1980-s, the dance floor would fill up instantly. Everyone was surprised when Joyce Kennedy released her first solo album. From that moment onward, fans in Germany would admire and follow Mother’s Finest for decades. The group even returned to ‘Rockpalast‘ in 2003 and 2016. Along with the ‘Rockpalast’ gigs by Earth, Wind & Fire (1979) and Rick James (1982), that Mother’s Finest concert was one of greatest and most memorable ones those Germans ever captured. More killer albums followed, including their legendary 1979 live record, ‘Iron Age’ and ‘One Mother To Another’. In 1984, the fans were in for a big surprise. An album entitled ‘Lookin’ For Trouble’ was released. The artist it was recorded by was not Mother’s Finest, but Joyce Kennedy. Yes, it was the first of two solo albums she recorded. The next surprise was the fact that ‘Baby Jean’ proved to the world that she could do smoother stuff too, including ‘Stronger Than Before’ by Burt Bacharach and Carole Bayer Sager. That same tune was recorded by Chaka Khan as well, that same year. With the album ‘Looks Could Kill’, Mother’s Finest were reunited in 1989. And they have been ever since. Sure, they took well deserved breaks here and there, but the legend lives. ‘Shut Up’ is the title of their new single. The fact that Joyce Kennedy is 71 years old by now does not show at all. She hasn’t changed a bit. All along, Mother’s Finest were more successful in Europe than in the United States. They have done far more gigs on this side of the Atlantic Ocean. And the dates of their upcoming tour reflect that phenomenon. 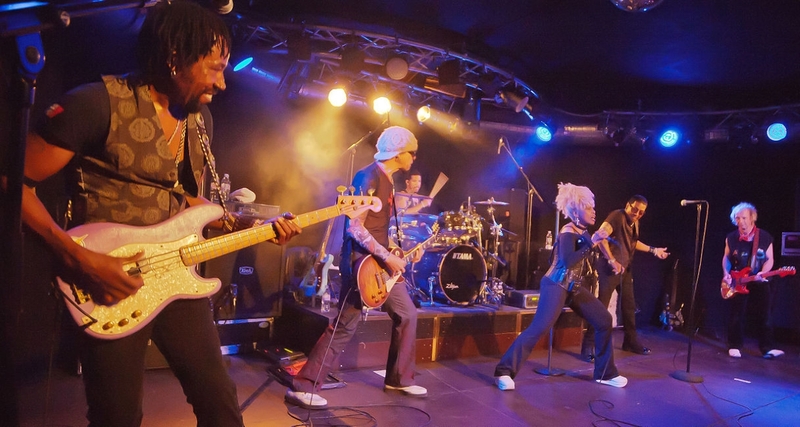 On January 26th, 2019, they will hit Regensburg, and Frankfurt on the 28th. Leverkusen is listed on the touring plan as well. So are Heerlen and Enschede in The Netherlands. Later they will be in Kassel, Koblenz, right here in Berlin, Bruchsal and in the Swiss town of Rubigen. The U.S. leg of that tour looks far more modest. Savannah, Athens and Macon will be covered, all in their home state of Georgia, where it all began in 1970. Mother’s Finest’s website and their detailed tour plan can be found here.